I talk a lot about how important it is to be able to shoot 1 hole groups at close distances with your carry gun. And I get a lot of flack for it. When you shoot at close distances where any gun with any ammo can shoot 1 hole groups, the outcome is a reflection on the shooter’s ability to execute the fundamentals in sterile conditions. It’s a basic demonstration that you can accurately line up the sights and press the trigger without disturbing sight alignment. And, if they can’t do that in sterile conditions, it’s almost guaranteed that they won’t be able to conjure up the skill under stress. What I’ve found over the years is that only about 10% of people who own or carry a firearm for self defense can stand 5-10 feet away from a target and shoot a 5+ round, 1 hole group on demand. Not all through the same hole…just all the holes touching. Interestingly enough, about 99% of these same shooters THINK they can shoot 1 hole groups. They usually have flyers or misses due to visual issues or disturbing sight alignment while pressing the trigger. It’s much better to have an accurate assessment of where you’re at than dangerously over-estimate your skill level. One hole groups in sterile conditions are just the beginning. And, even though being able to put 5 rounds in a touching group at 6-10 feet in sterile conditions is relatively worthless in a self-defense context, it’s still a very valuable skill. Because shooting is a crawl-walk-run process. Shooting one hole groups shows that you can execute the fundamentals precisely when the stress level is low enough that you can think your way through the process. Slow, steady pressure on the trigger without disturbing sight alignment until you have a surprise break. You might even take time to get a perfect stance and time your breathing. Very little application to self defense shooting with a pistol where you have to take the shot off balance and most ricky tick. But shooting one hole groups in sterile conditions is still a VERY important step in the process. Typically, when you learn a skill, you think through the steps consciously. You may remember how to do the skill a few days later, but it’s stored in a different part of the brain than a skill that you can execute at a high level without thinking through the steps. In a high stress situation, your brain increases performance by shutting down A LOT of normal functions and big parts of your memory. We see the impact of this fairly often when people shoot an attacker in self defense at kitchen distances and miss with 60%, 80%, or 100% of the shots they fire. They may be able to drill bullseyes on paper. They just didn’t have their gun handling skills stored in the right part of their brain. In a high stress situation, you will have access to skills that are stored in implicit memory. These are your conditioned responses. Skills that you’ve practiced until you don’t have to think about them. So, one hole groups are great…but they’re not the end goal…they’re a step in the process. 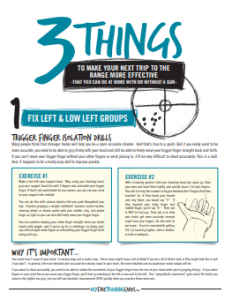 The end goal is to be able to shoot 1 hole groups subconsciously…as a conditioned response…with the skill stored in implicit memory…so you can access and use the skill in a high stress shooting situation when lives are on the line. Once you can shoot 1 hole groups, you want to start speeding up until you’re able to shoot them faster than 1 round per second…then increase the number of rounds and stretch out the distance. Like I said, you can think your way through shooting 1 hole groups. But when you demand precision and speed up the splits to faster-than-one-second, the conscious mind tends to get overloaded after about 3-5 rounds. If you’ve got precise conditioned responses stored in implicit memory, you can keep drilling rounds through the same hole for 5, 10, or more rounds in a row. If you don’t have precise conditioned responses, the groups will open up…FAST and WIDE. What about 1 hole groups being bad for stopping threats? That’s a myth based on misunderstandings. The bigger the difference between your training conditions and reality, the more precise you should be. If you’re shooting in sterile, slow, low stress conditions, strive for pinpoint accuracy. If you’re doing force on force training in low light with multiple attackers shooting at you, just make your hits. But the fundamental skills of being able to press the trigger without disturbing sight alignment and being able to put rounds where you want them to go is always something you should strive for, regardless of the situation. You can ALWAYS speed up or choose to shoot looser groups, but you can’t conjure up the ability to shoot precisely on the fly. Besides…in a dynamic, chaotic self-defense shooting situation, the movement of your attacker will more than likely spread out where the rounds impact, even if you drill each round through the exact same trajectory. So, what’s the best way to move these skills that you probably already know how to do at the range with no stress to the part of the brain that will be firing on all cylinders when lives are on the line? In short, it’s not more practice…it’s practicing smarter. Not shooting a certain number of rounds or doing a certain number of dry fire reps or practicing for a certain amount of time, but using training methods designed to quickly drive skills deep into your motor cortex…way, way quicker and deeper than what you can do with traditional training methods. When you practice, once you can do the base skill, add novelty and cognitive load. For draw stroke, it might be dry fire practicing draw stroke standing on one leg instead of 2. Or counting backwards from 100 by 7s out loud as you do your dry fire reps.
Or stepping off the x as you draw, present, and acquire a sight picture. The difference in learning speed is dramatic. If you just practice the same skill, over and over with little variation, you’re not going to get much neurogenesis, or new neural connections in the brain. But if you keep adding slight variations to a skill that you know, every few reps, you will create up to 1.7 MILLION new neural connections per second. That’s just a tiny example of how we’re able to get better results in less time and for less money than what you can get with traditional training methods. It’s not just a matter of dry fire vs. live fire…it’s a matter of HOW you train–training smarter–regardless of what tool is in your hands. So, if you carry a firearm or own a firearm for self-defense purposes, you owe it to yourself to go through our training. Now. If you haven’t gone through 21 Day Alpha Shooter yet, it’ll guide you through a 5-15 minute per day follow-along dry fire training program that you can do in your living room. When you finish it, your skills will be more refined than 90% of gun owners in America today.